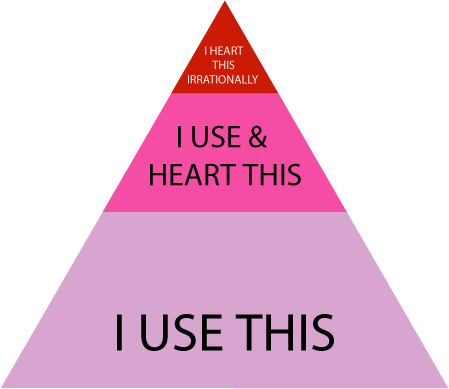 "I use this" versus "I heart this"
We all have apps and products we use everyday. Some we probably couldn't live without, in fact. Those, for me, represent all of the Google properties they have me nicely tied into. I tried to resist, but they are so darned useful! I also use stuff like Blinksale and Paypal and Backpack and Harvest and Skype, etc. If any of them go down, I start to panic. Each one of them is essential and I rely on them to work well (and there are many more I rely on daily, too). I chose them, primarily, on how well they worked, the UI, the way they interoperated with my other apps, if they did the job well, and, well, sometimes because I got locked in (and the switching costs are so high that something spectacular would have to come along). On the other hand, I have apps and services that are USEFUL, but they are also near and dear to my heart. 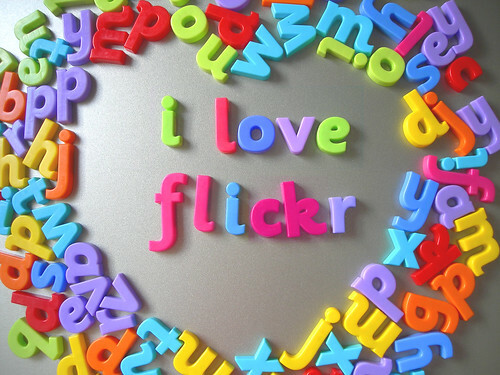 I've talked about a few of them here already, but they include Flickr, Zipcar, Pandora, Blue Bottle Coffee, Blip.tv, Ma.gnolia, Wordpress, etc. I have a deeper, more emotional connection with these tools. Either I relate them to the people behind them, my network on them, my experiences with them and the way that they have not only solved day-to-day issues for me, but they've also enhanced my life. Most all of them, I have discovered through a strong recommendation from a friend (or, sometimes, several strong recommendations before I went, "Fine! I'll try it!" Then I got hooked and became a superfan). These are the thinks I use AND I heart. There are three levels of emotional fervour here, but I think that 'community' is only possible when I HEART THIS enters the picture. That's when you'll see people starting to connect. And community, really, only happens when connections are made (on a more persistent basis). That being said, the "I USE THIS" camp of apps are incredibly essential...they don't require "I HEART THIS". They just have to work well. And, in actuality, if you try to add the emotional component, they start to feel a little silly (I'm not really jazzed about a financial management community, sorry...I don't see how that helps me. It actually freaks me out a bit). And, in my personal viewpoint, being in that middle ring of useful and lovable is probably the sweetspot for community as well as long-term feel-good life-time of warm and fuzzy customer loyalty.